In celebration of International Women’s Day IFAD, the Food and Agriculture Organization of the United Nations (FAO) and World Food Programme (WFP) jointly organized an event that focused on empowerment of rural women. The celebration took place on 6 March at IFAD headquarters, and among the attendees were staff from IFAD and its partner agencies, representatives of civil society organizations and around 50 students from universities in Rome. The theme for International Women's Day 2015 was "Empowering Women – Empowering Humanity: Picture It!" To celebrate that theme, a call went out to IFAD-funded projects asking them to submit photos from their work on women's empowerment in their countries. More than 100 photos were shared from 22 country offices around the world. See highlights here. This year also marks the 20th anniversary of the Fourth World Conference on Women in Beijing. International Women's Day was therefore a special occasion to celebrate achievements made since Beijing and to discuss remaining challenges. In light of this, the Rome-based agencies dedicated the celebration to empowering rural women to achieve food and nutrition security. The event was followed by a Gender Share Fair where a number of organizations showcased innovative practices designed to empower rural women. 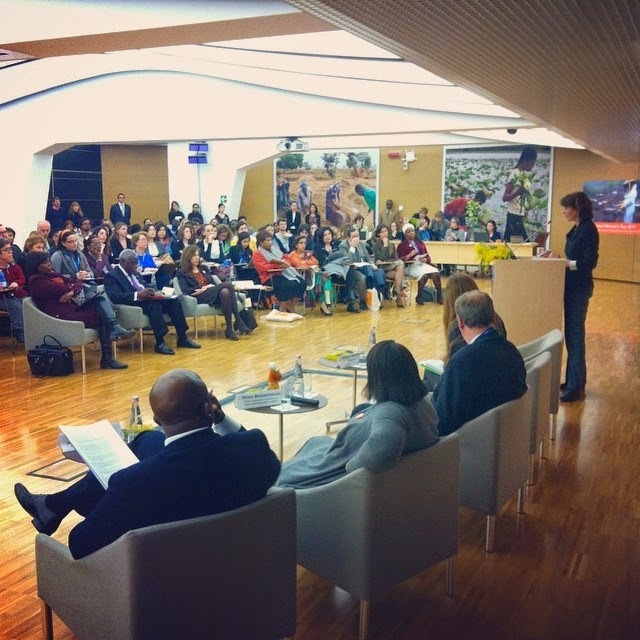 The International Women's Day event at IFAD on 6 March. The opening speech by IFAD President Kanayo F. Nwanze emphasized that women are the backbone of rural societies. But unfortunately, many of them are also doing the back-breaking part of the work, and their access to productive assets and services is limited in most rural areas. Many studies have shown that rural women's economic and social empowerment leads to improvements in agricultural production, food security, nutrition, economic growth and social welfare. Their empowerment has a positive impact on themselves, their families and their communities. As Nwanze said: "If you invest in a rural woman, you invest in a community." Gender equality opens doors to entire communities, and the Beijing +20 anniversary is an opportunity to do more to recognize the role of rural women, provide them with more opportunities and better access to assets, and strengthen their voices in decision-making processes. In her statement at the event, Marcela Villarreal, Director of the Office for Partnerships, Advocacy and Capacity Development at FAO, also highlighted Beijing +20 as an occasion to reflect on what has changed in the past 20 years. On the development scene, significant progress has been achieved, she said. Millions of people are out of poverty and hunger, and development processes are now involving multiple actors, including civil society and the private sector. There is more awareness about gender inequality and the costs of not involving women in development. But many challenges remain, and rural women fare worse on all human development indicators compared to men and urban women. Rural women are still burdened with heavy domestic and care-giving workloads in most societies; in sub-Saharan Africa, women spend 40 billion hours every year to fetch water. Hence, more needs to be done to build on existing achievements. Let's not wait until Beijing +40 to see real advancement in the conditions of rural women, Villarreal said. Four stories were presented in a panel discussion on nutrition, community mobilization, livestock and land. Those areas are all essential to empowering women to achieve food security and nutrition security. Britta Schumacher, Programme Policy Officer at WFP, presented the work of REACH, which stands for ‘Renewed Efforts Against Child Hunger and under-nutrition’. A very informative video showed experiences from REACH in Bangladesh, reporting on misleading cultural messages about child feeding and diet during pregnancy – for instance, that eating less during pregnancy to ease childbirth, or that feeding infants with water and honey so that they 'talk modestly' when they grow up. In addition, the video illustrated the weak status of women within households and communities – highlighting the issue of teenage and child marriages, and women's lack of decision-making power. Through participatory approaches, REACH aims to bring women out of the household, interact and share experiences to increase their knowledge on nutritional issues. Women's knowledge about nutrition is essential for the healthy growth and development of their infants, and for the well-being of women, of the household and, ultimately, of the community as a whole, enabling them to rise out of poverty. Andrea Sánchez Enciso, Gender and Participatory Communication Specialist at FAO, presented information on FAO-Dimitra 'listening clubs' and the Joint Programme on Rural Women's Empowerment in Niger (which involves FAO, IFAD, WFP and UN Women). The Dimitra clubs created spaces for farmers to discuss issues affecting their livelihoods, so they could collectively build a strategy in order to bring about real change. 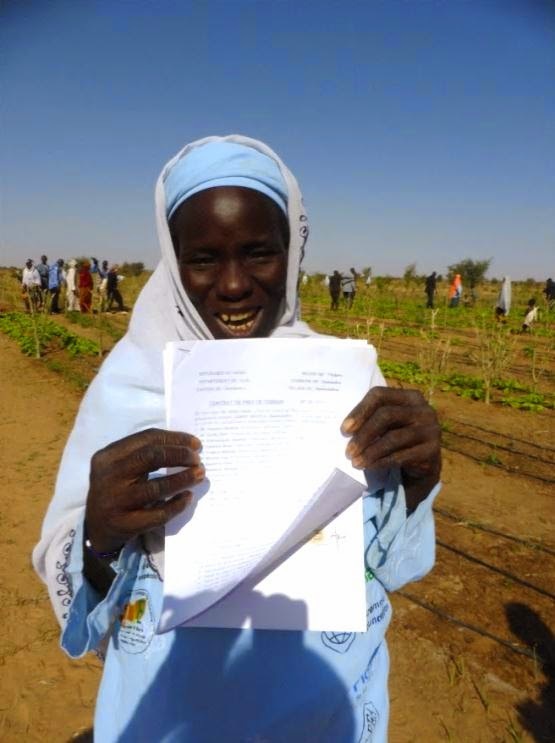 In the case presented, insecure land tenure and access to water were constraining farmers' lives, but through community mobilization they were able to obtain a 99-year land lease contract of 3 ha of arable land, in addition to drip irrigation. Such a participatory approach enhanced leadership capacities and gave participants the needed confidence to present their arguments before different actors. Antonio Rota, Lead Technical Specialist-Livestock, Policy and Technical Advisory Division, IFAD, stressed the important role that women play in livestock (e.g. milking and carrying feed and water to animals), and how livestock programmes can be important to women's empowerment as an entry point for other development activities (e.g. education and micro-credit). 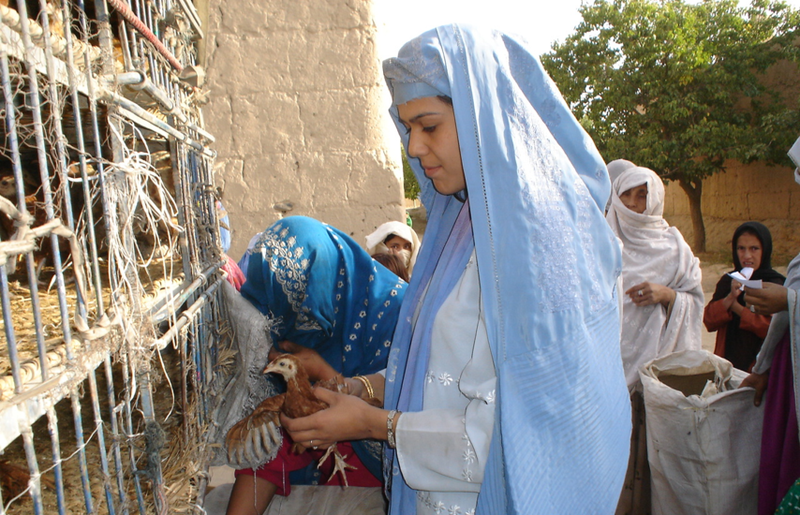 Indeed, through the Family Poultry Development Programme in Afghanistan, women – mostly widows and destitute – were provided with assets in the form of chickens, along with appropriate and gender-sensitive training. At least 75,000 women benefitted from the programme, increasing profitability by 91 per cent, and boosting egg and chicken consumption by 88.9 per cent and 67.7 per cent, respectively. Mino Ramaroson, Africa Regional Coordinator at the International Land Coalition, introduced two African experiences of women's networks – the National Federation of Rural Women in Madagascar and the Kilimanjaro Initiative – advocating for their rights to land and natural resources. These two examples of mobilization of rural women benefitted them by strengthening their confidence to express their needs and work together towards the recognition of their rights. Recognizing women for their knowledge, skills, strength and contribution to the household and community. In her closing remarks, Ertharin Cousin, Executive Director of WFP, stressed that the Rome-based agencies need to work together to be more effective and efficient. We are serving the same population, she said, and the efficiency which donors demand is also demanded by the beneficiaries. She also emphasized that the global community will not advance if 50 per cent of the population are locked inside their homes, without influence and without having a voice. We need to unlock this potential, Cousin said. To do this, men need to stand up for gender equality, and women need to speak up to support other women.